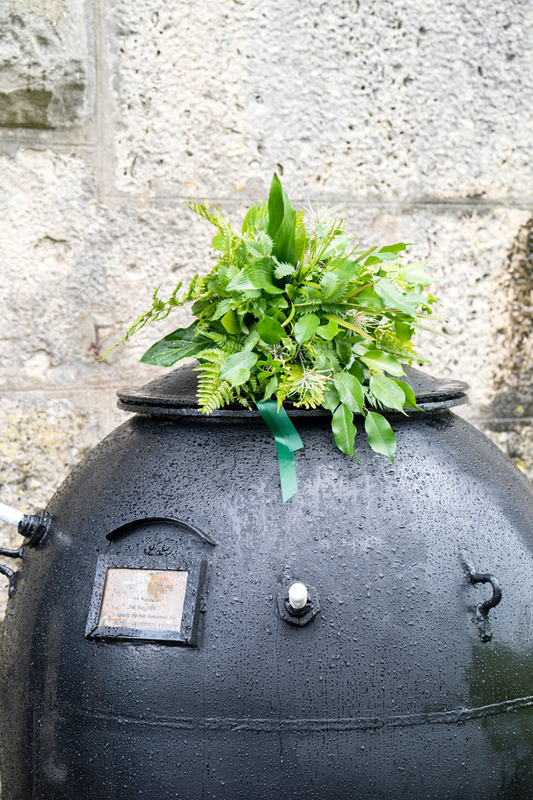 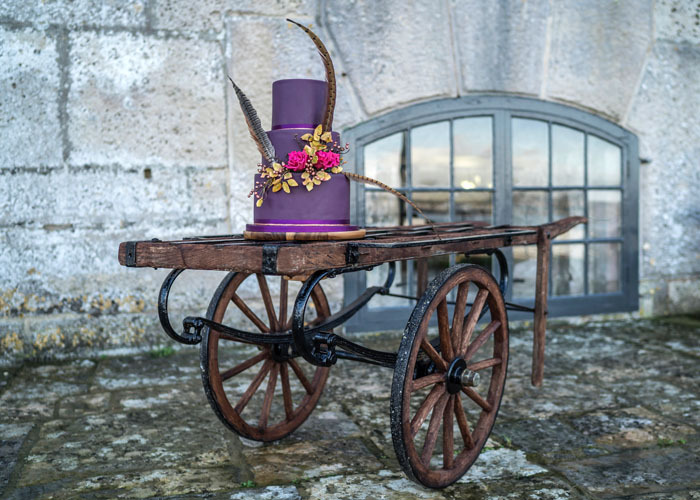 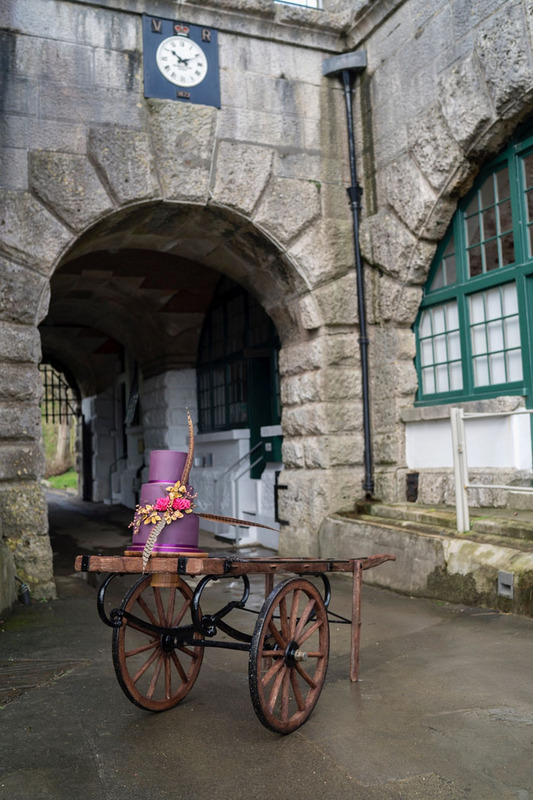 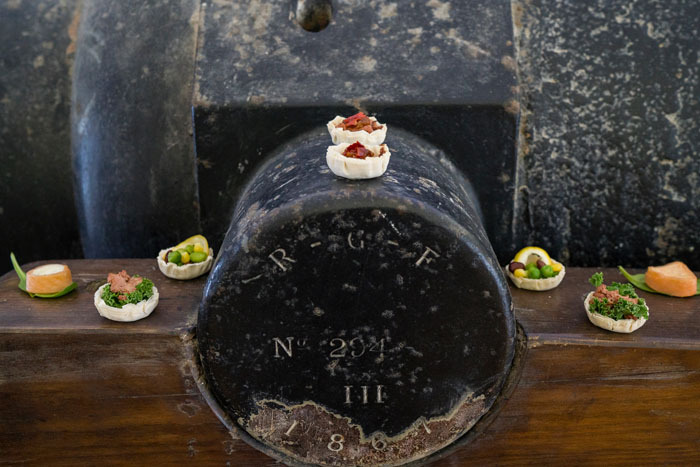 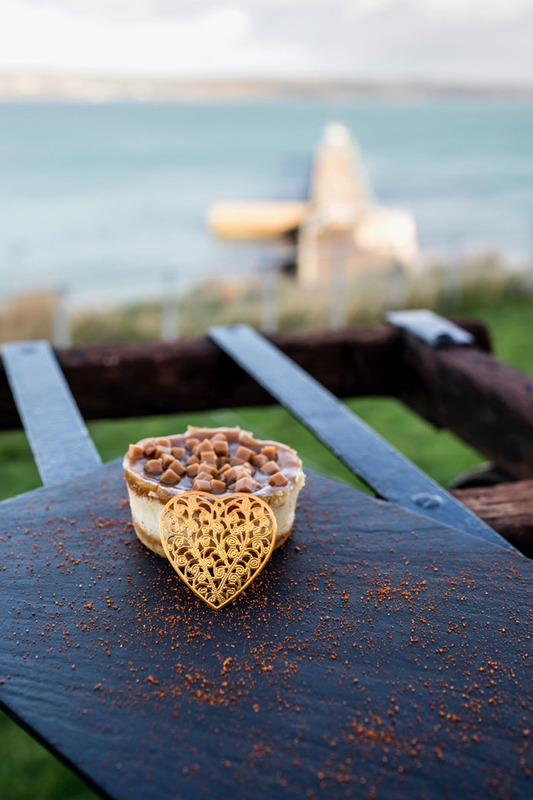 The Nothe Fort is a Victorian fort that hosts stunning views over Weymouth Bay and Portland Harbour, offering a quirky and unique venue for your wedding. 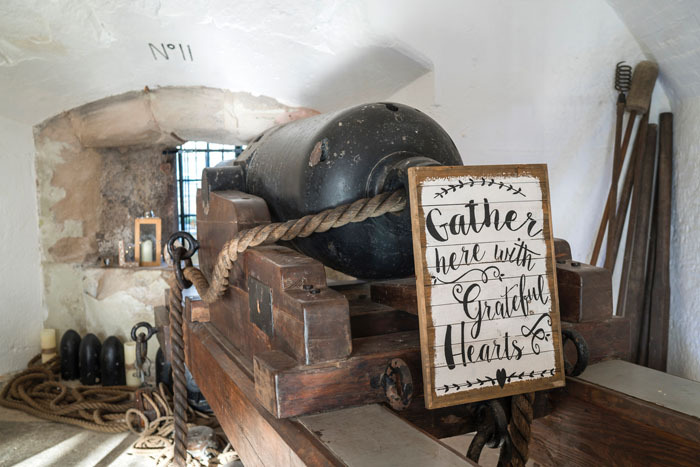 You just gaze with awe while looking at the great historicity, fine architecture and fabulous views of the Dorset coastline as soon as you step foot inside the parade ground, or on the terrace and ramparts. 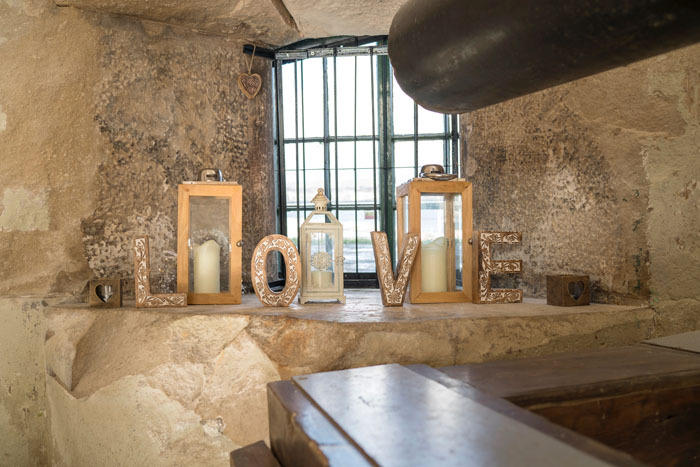 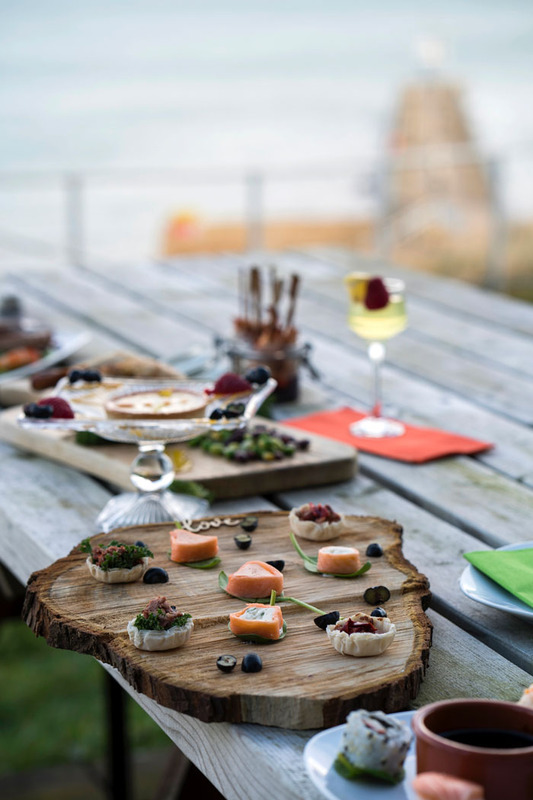 This is certainly a venue with a difference, as you can walk and capture special memories below ground, along the passageways, or on the upper level to capture the breathtaking sea views behind, while you dine on the terrace. There are so many spots inside and outside the Fort that make for great photographs. 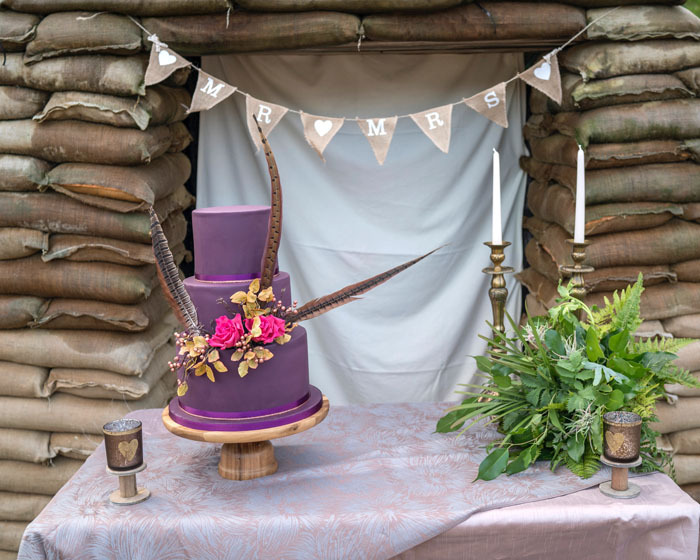 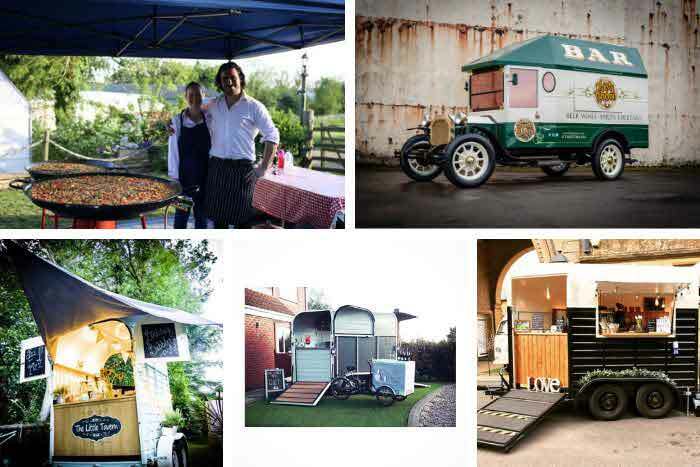 We chose the rustic theme as our inspiration to show how you can have a wedding at an historical venue and remain sympathetic to its history, but still add a slight modern twist with elements of copper and foliage, along with accents of colour from the cake, food and flowers. 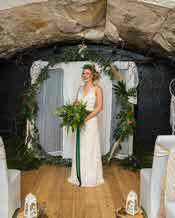 Rachel from Love by Design Weddings did the venue styling and dressed the entrance leading in to the ceremony room. 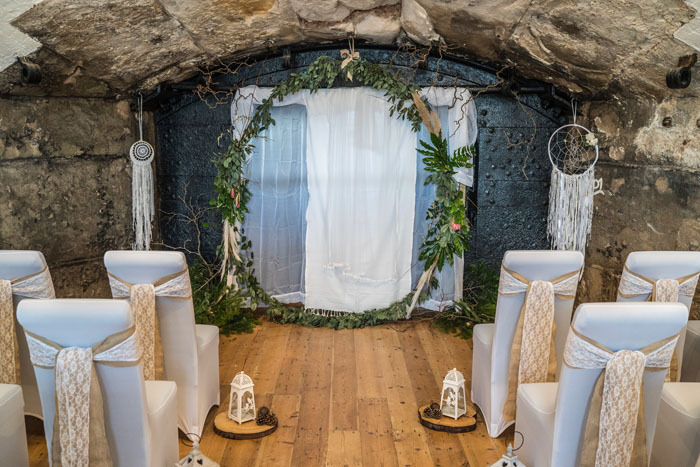 She says: “In the entrance, with its cannon and heavy ropes, exposed stonework and wooden flooring, the rustic theme was the obvious choice. Lanterns were used on the window ledge. 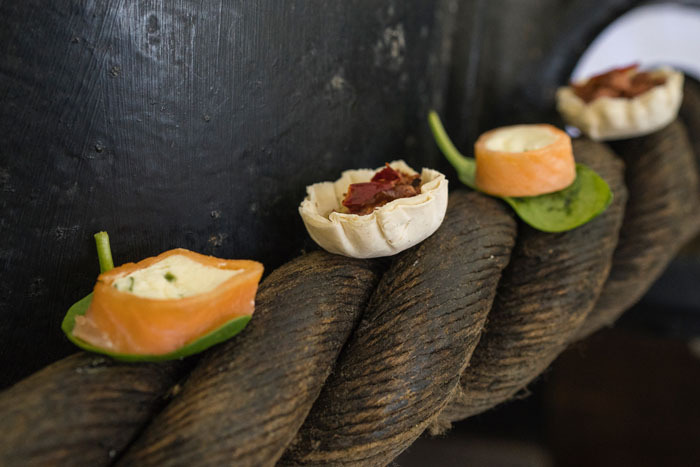 Hand decorated tealight jars in bark wrap and hessian were used to embellish the cannon, together with a rustic sign." 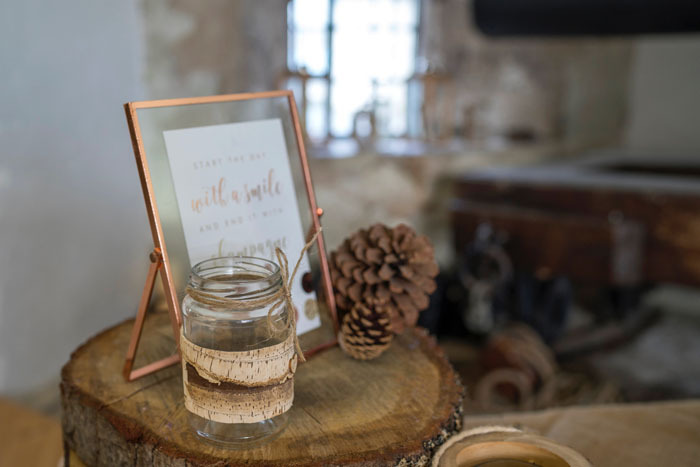 "The inspiration for the styling for the ceremony was taken from the exposed floorboards and stone walls," continues Rachel. 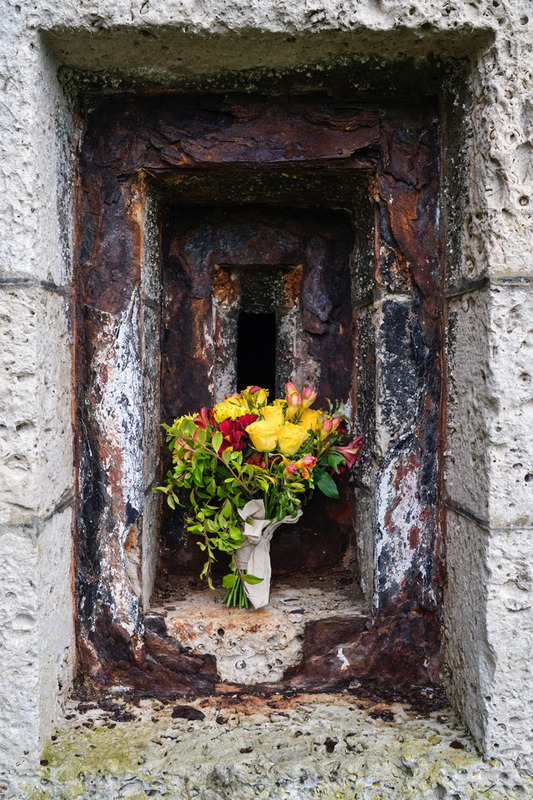 "This is such an historical building that we felt anything too modern or overly glamorous would look completely out of place. 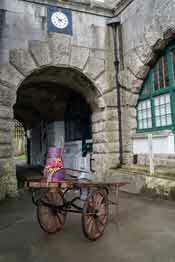 The chairs were dressed with double sashes of hessian and lace. 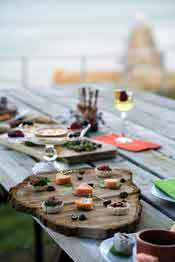 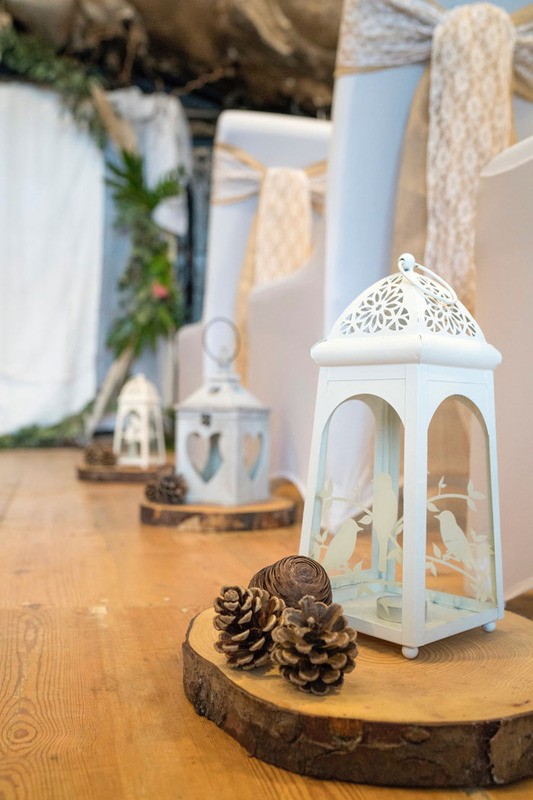 The aisle was lined with wooden log slices, topped with lanterns, pine cones and candles. 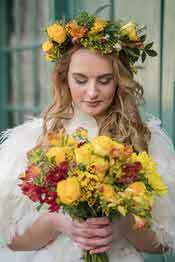 The only colour of the room came from the floristry work." 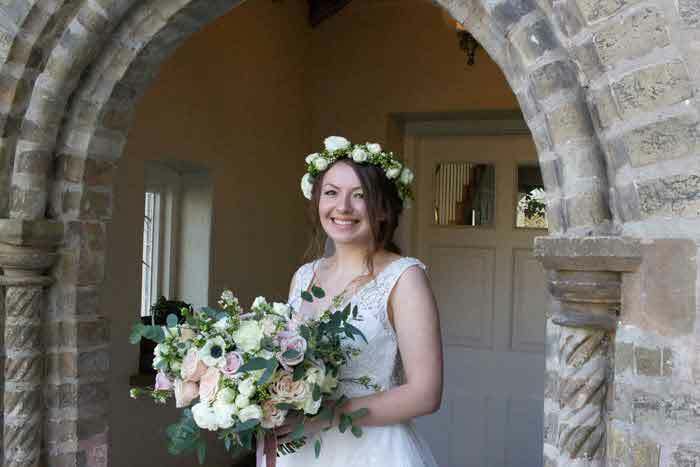 We collaborated and came up with the idea of using a big wreath, as this is known as the new ceremony arch and we knew that it would look great with the stone walls and iron works as the backdrop, alongside the handmade fabric dreamcatchers created by Winterborne Vintage. Dawn from The Cottage Window was the florist for the shoot; she says: “My brief was a natural rustic scene, not an easy task in January, so I set about foraging. 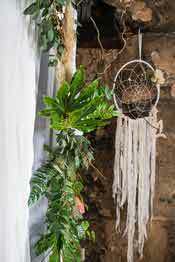 I wanted to use ferns and pampas grass as I love them for their shape and form. 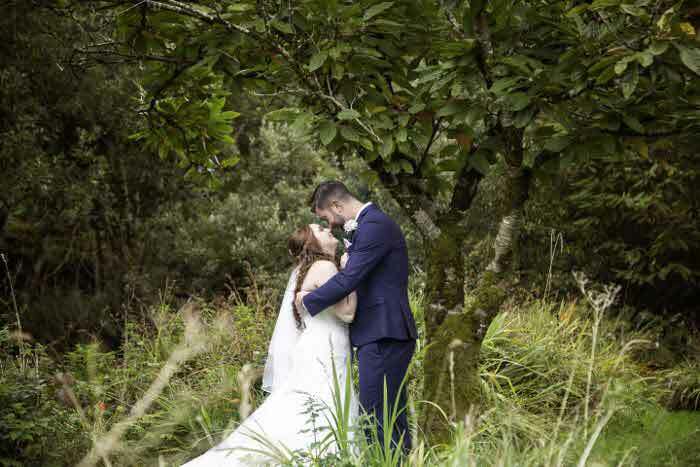 It was a joy to use just greenery as people underestimate the colourways of green. 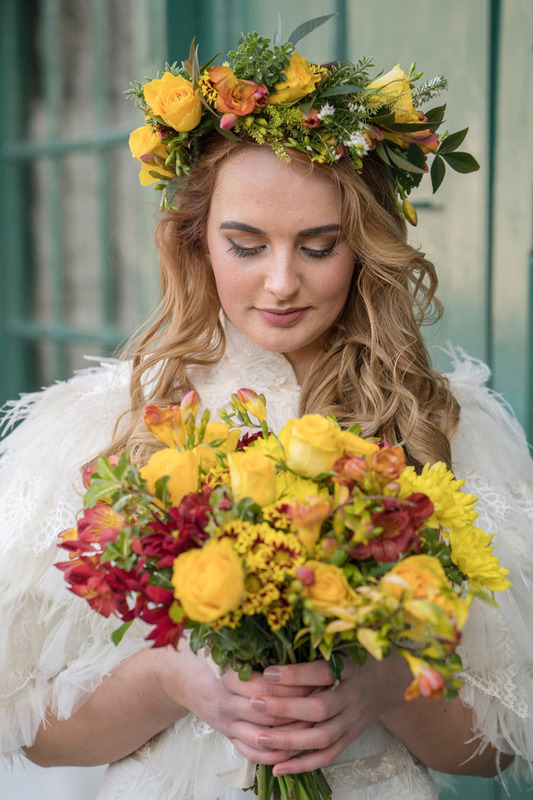 The second brief was more colourful and it was with great gusto that I set about the posy and flower crown to match the model’s beautiful hair colour. 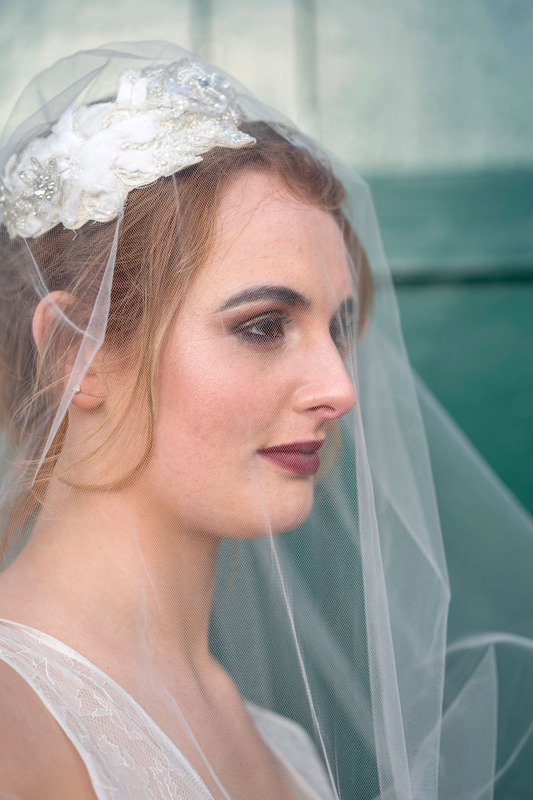 This matched perfectly with the colour of the dresses and textured cape accessory." 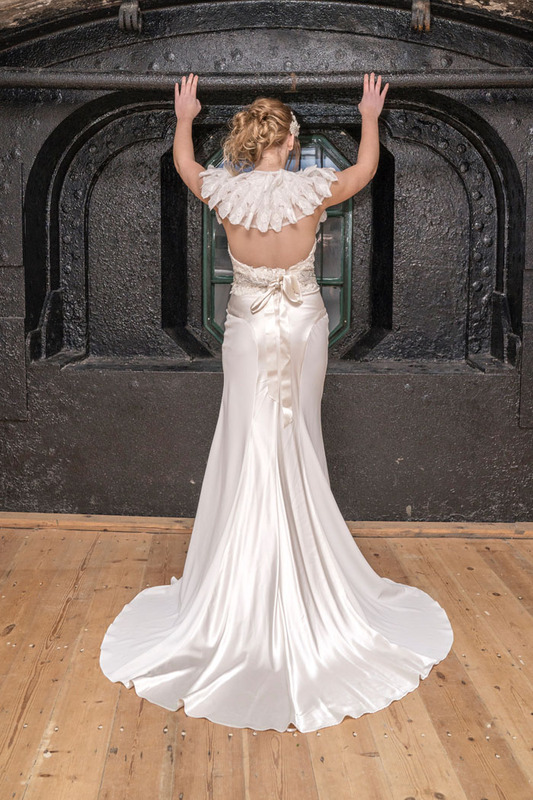 The dresses were all by designer Terry Fox who has more than 30 years’ experience behind the sewing machine and is an award-winning bridal designer. 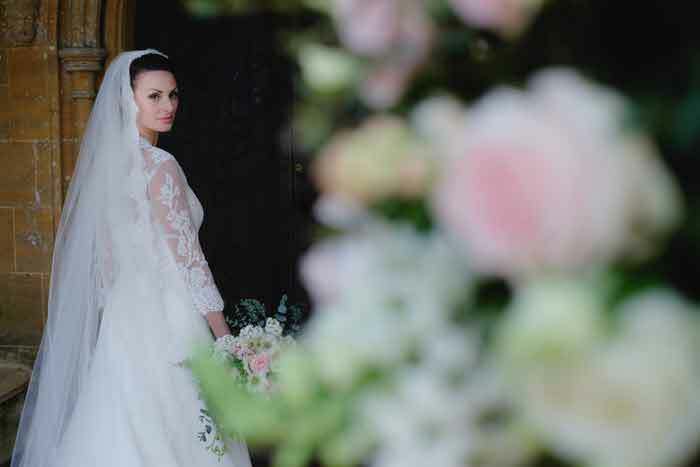 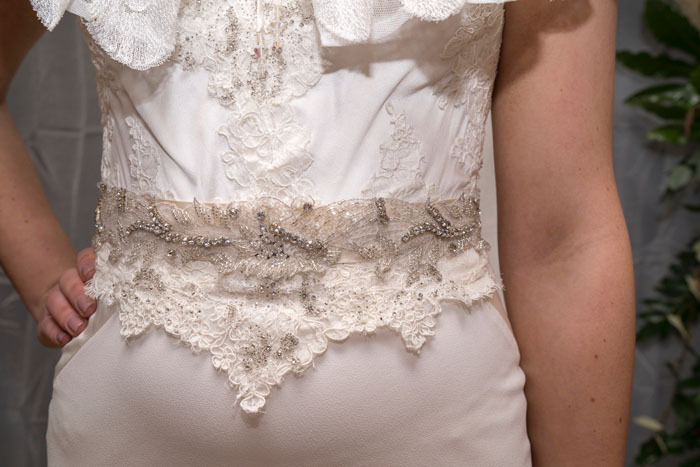 Her dresses have been beautifully handmade using the very finest silks, satins and lace, with every bead, sequin and flower lovingly sewn by hand. 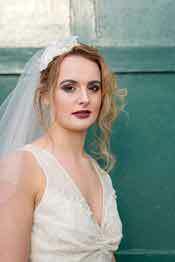 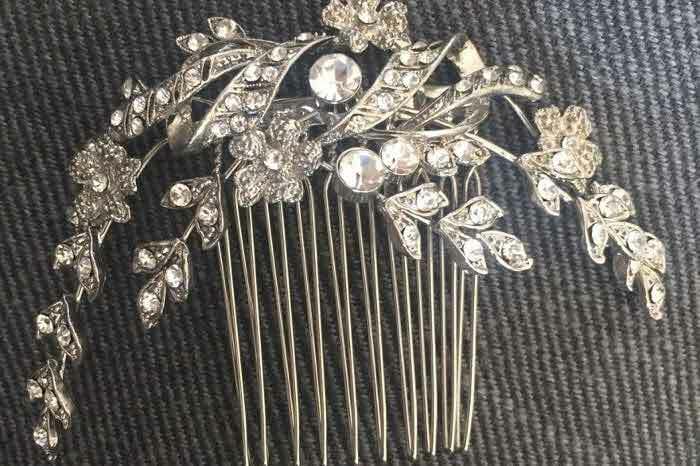 She has recently moved to the area and wanted to collaborate with Bridal Reloved in Dorchester. 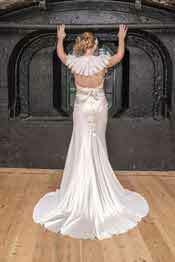 We chose these dresses as we knew they would offer the romantic feel against the historicity of this venue with their floaty fabrics. 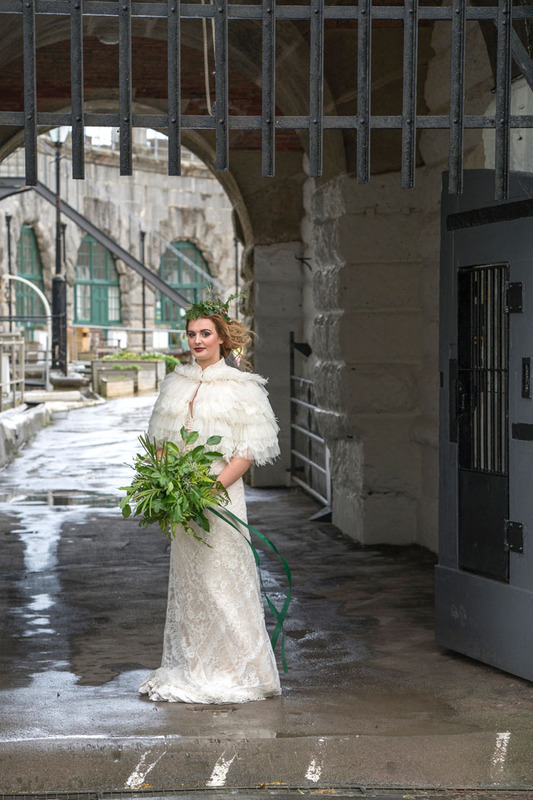 The textured layers of the cape added glamour and warmth and the antique lace and vintage embellishments tied the whole look together, working perfectly against the architectural elements of the old Fort. 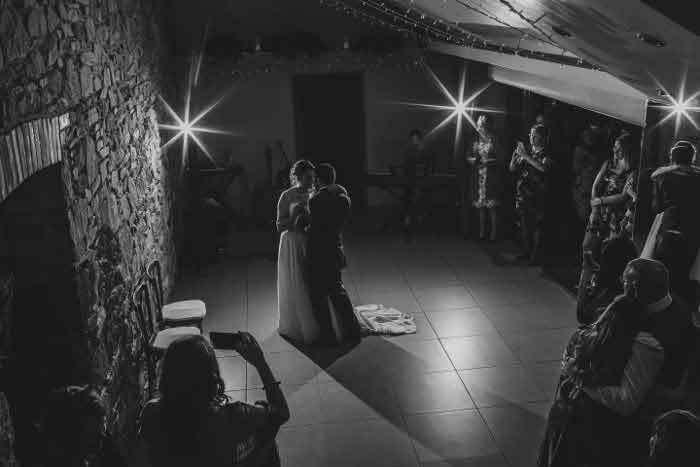 Jim, the photographer, captured the drama of the passageways perfectly with the lighting, showcasing the detail of Terry’s dress beautifully. 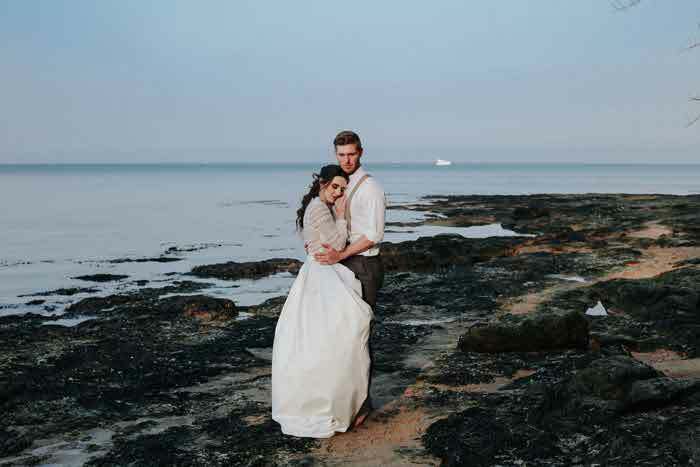 These are my favourite shots from the whole shoot. 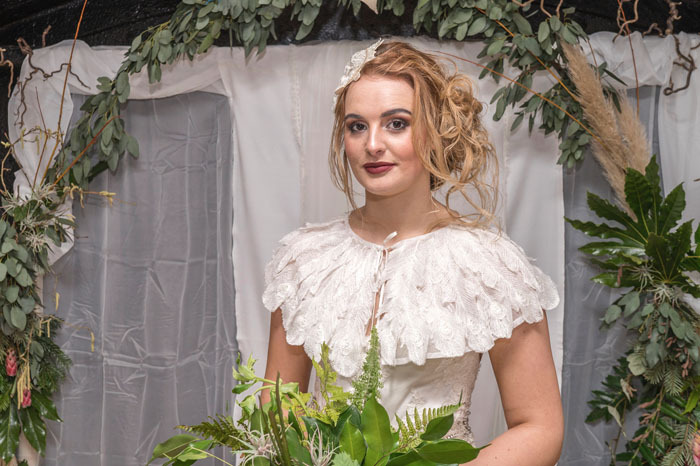 “The first look was created by pin curling the model’s long hair so that when I had finished her make-up and released the pins it created soft voluminous curls which suited the amazing flower crown perfectly. 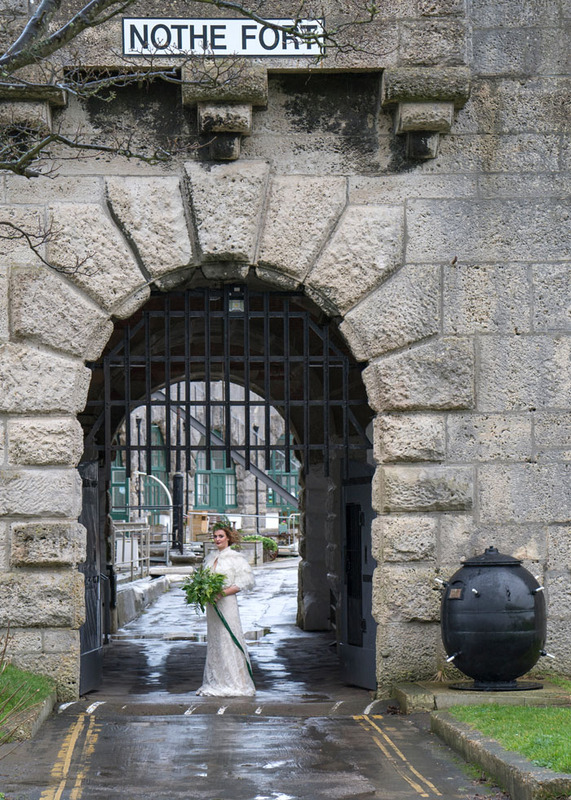 I kept her make-up flawless and her eyes and lips natural with soft browns and nudes that complemented the flower colours and looked amazing against the green doors of the Nothe Fort." 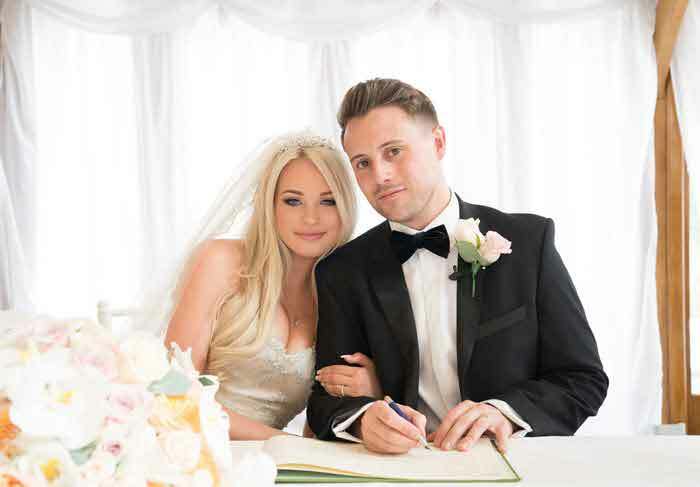 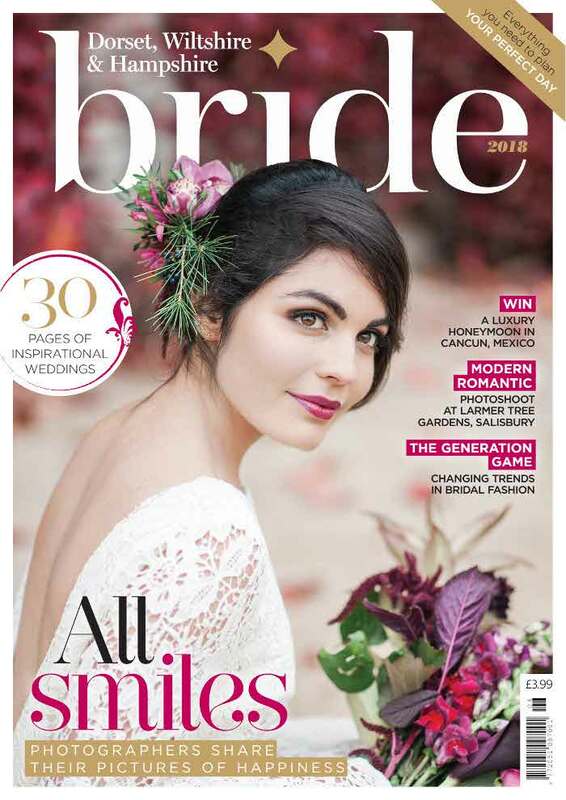 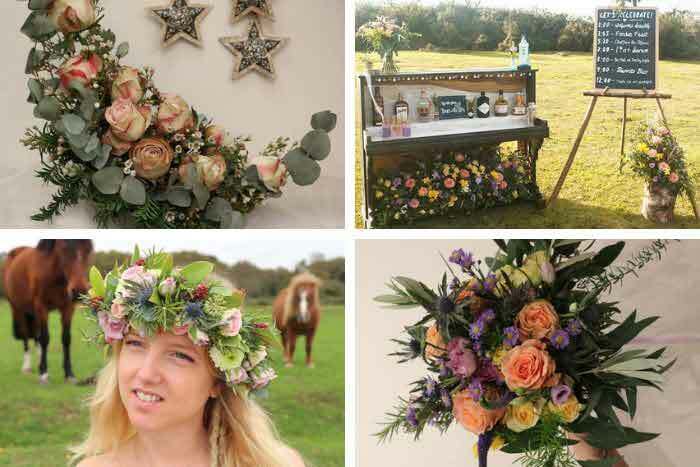 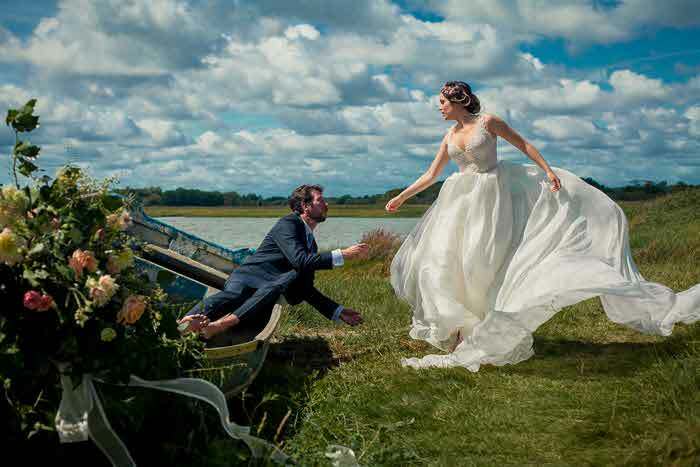 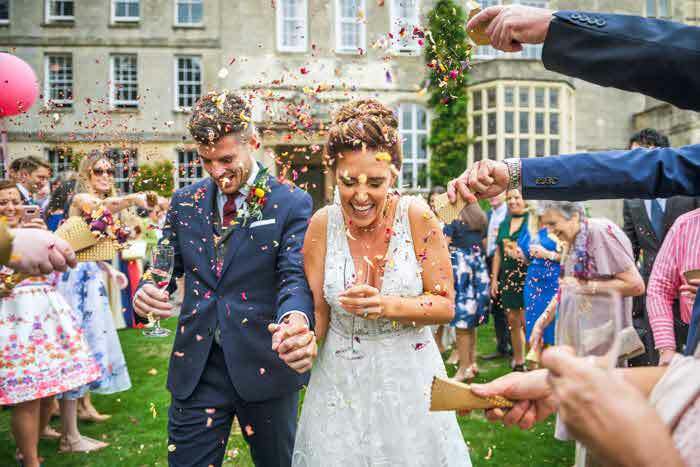 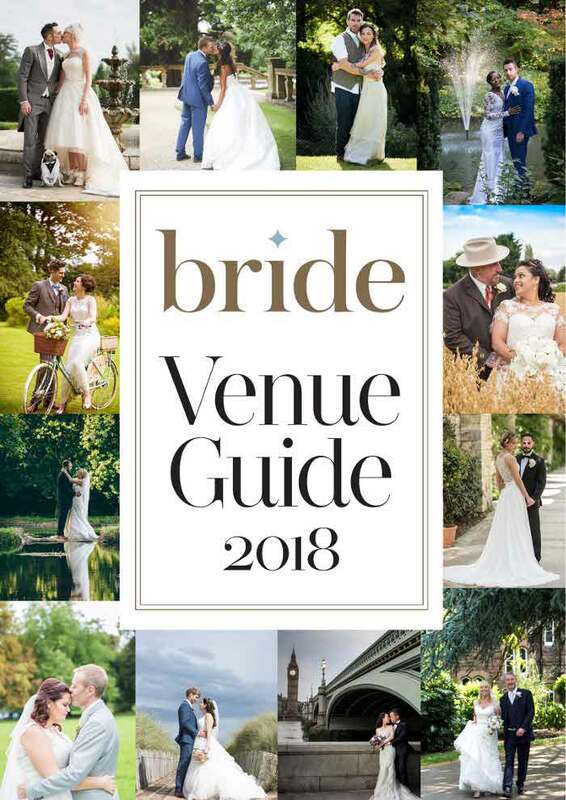 For more Dorset wedding inspiration, pick up the latest issue of Dorset, Wiltshire & Hampshire Bride magazine.